According to Battery University, the less you allow a Lithium-based battery to discharge before charging it again, the less wear it will undergo and therefore the longer lifespan it will have. (e.g. discharging to 40% before charging is better than discharging to 0% before charging). Similar to a mechanical device that wears out faster with heavy use, the depth of discharge (DoD) determines the cycle count of the battery. The smaller the discharge (low DoD), the longer the battery will last. If at all possible, avoid full discharges and charge the battery more often between uses. However on the AccuBattery application website this is disputed, and it is claimed that according to research done by Choi, there is no additional wear incurred by allowing a full discharge. Does fully discharging modern Lithium-based batteries (such as those used in phones) reduce their lifespan significantly more than discharging them to say 30% or 40%? For a TLDR version, jump to the last paragraph. 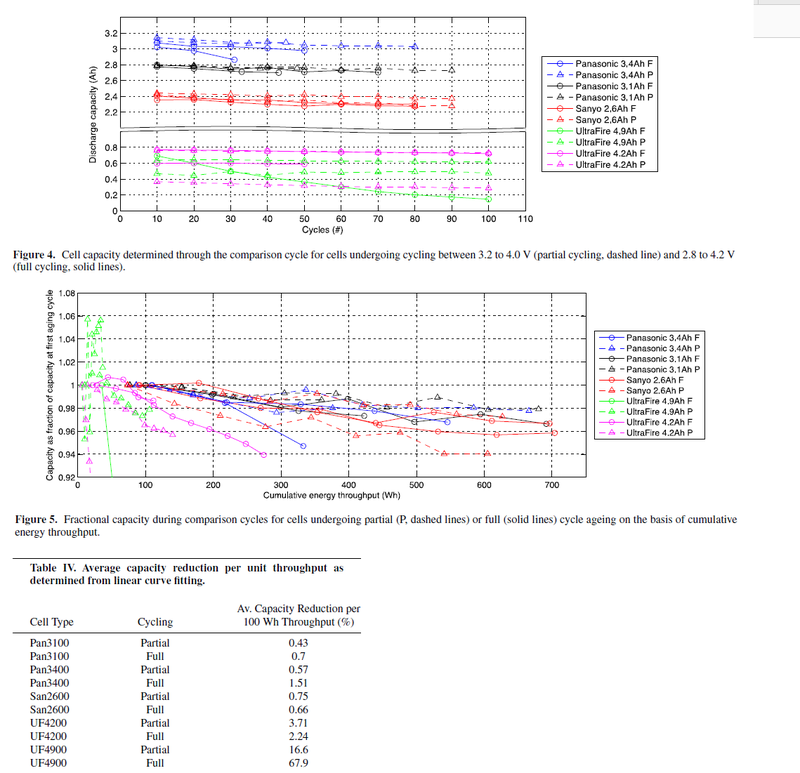 An extensive test has been conducted on a lithium-ion (Li-ion) cell under a variety of cycling conditions in order to evaluate factors that affect its cycle-life. The study is performed on a 900-mAh wound prismatic cell with contains a LiCoO2 positive electrode (cathode) and a synthetic graphite negative electrode (anode). Cycle-life is greatly influenced by the charge conditions, but is relatively insensitive to the discharge conditions. High charge cut-off voltages and a long float-charge period at 4.2 Vor above have the most severe effects on cycle-life. Another damaging condition is high charge rates above the 1C rate, but reduction in the depth-of-discharge does not improve the cycle-life unlike the situation with other rechargeable batteries such as alkaline and lead–acid batteries. The dependence of the degradation rate on the charge voltage and the period of high charge voltage suggests that an electrochemical oxidation may be the cause. To estimate the DoD effect on cycle performance, change in capacity for a regime in which the discharge was cut-off at various voltages that ranged from 2.75 to 3.55 V after fully charging the cell at the 1C rate are shown in Fig. 5. No noticeable dependence of the rate of capacity decrease with cycling on the DoD is observed within 500 cycles. The tougher question is whether all Li-ion batteries are like these, because the Choi and Lim study is rather narrow in its scope. Unfortunately they don't specify in those slides the exact chemistry of cells tested (besides "Li-ion" in the title of the presentation). They might have a paper somewhere where that is detailed. So I think in light of the latter the Choi & Lim statement (and as conveyed AccuBattery) is roughly true, unless you care about those extra 2.5-15% after a thousand cycles. Conversely, if you intend to achieve millions of cycles instead of thousands (as the latter is typically designed for in consumer electronics) then DoD would be a significant issue. Fig. 4 also shows illustrates how partially cycled cells aged as compared with fully cycled cells. 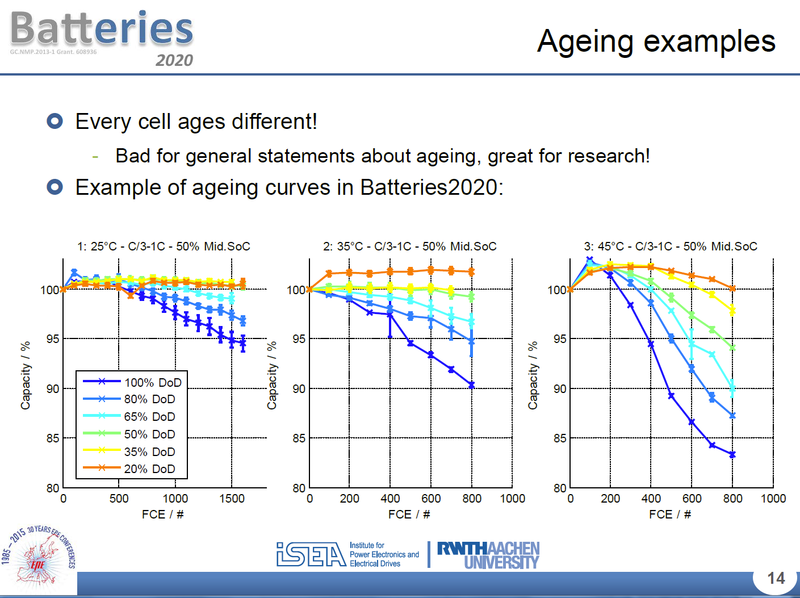 For the Sanyo and Panasonic cells there is a clear trend of partially cycled cells age less with each cycle than compared to full cycles as expected. However, due to partially cycled cells absorbing and supplying less charge and energy in each cycle than fully cycled cells, a comparison on the basis of cycles is somewhat less meaningful than a comparison on the basis of cumulative energy throughput as is shown in Fig. 5. Comparing the cells by fitting linear curves to the energy throughput measurements yields a non-conclusive result as shown in Table IV. While for both types of Panasonic cells and the UF4900 cells the partial cycles lead to a lower average degradation per energy throughput than full cycles, the San2600 and UF4200 cells find that partial cycles lead to a higher degradation. This inconsistent result suggests that the sample size of two cells per type and discharge cycle is insufficient for conclusive studies of the impact of slight cycle variations on ageing. The cut-off voltage of the discharge stage (V2) ranges from 3.0 V to 2.4 V. Fig. 9 shows that the capacity fades fastest when the voltage is at its middle level (2.5 V). This result differs from Fig. 5 of Choi’s study  that the DOD has little effect on aging within 500 cycles. The reason for the phenomenon that cells aged faster at V2 = 2.5 V than V2 = 2.4 V is not fully understood. 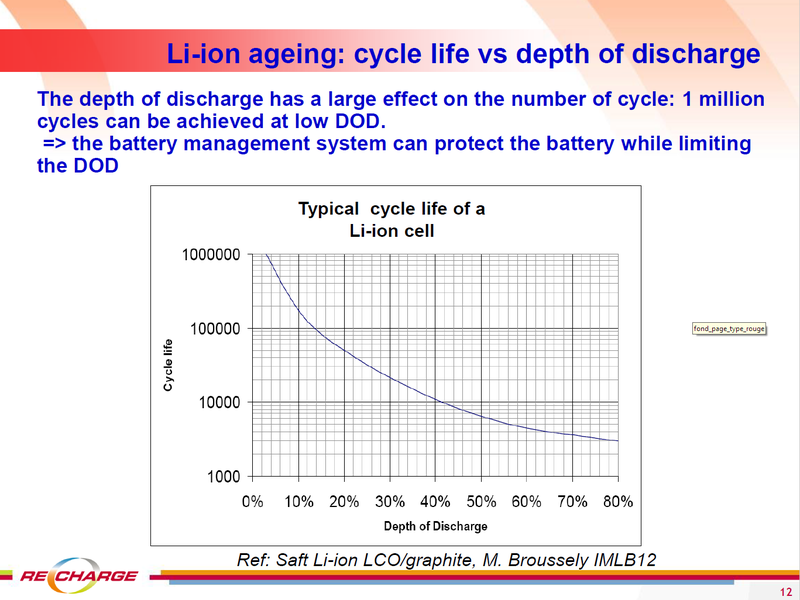 The aging rate under cycling conditions for lithium-ion cells is affected by many factors. 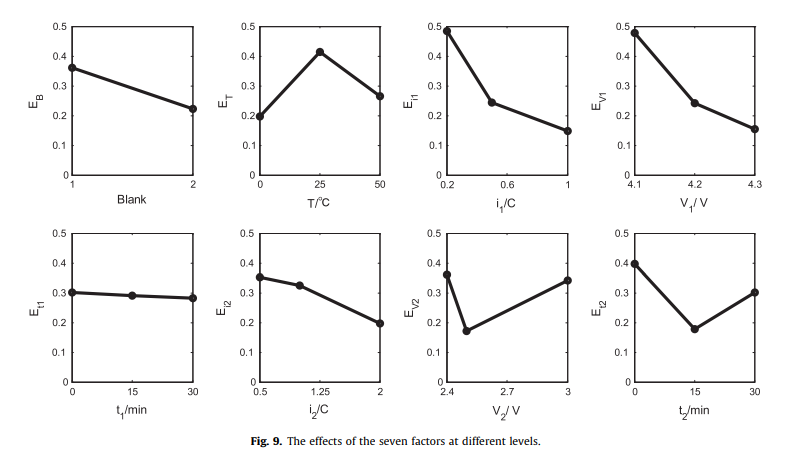 Seven principal factors are systematically examined using orthogonal design of experiments, and statistical analysis was used to identify the order of principal factors in terms of strength in causing capacity fade. These seven principal factors are: the charge and discharge currents (i1, i2) during the constant current regime, the charge and discharge cut-off voltages (V1, V2) and the corresponding durations (t1, t2) during the constant voltage regime, and the ambient temperature (T). An orthogonal array with 18 test units was selected for the experiments. The test results show that (1) during the initial 10% capacity fading period, the capacity faded linearly with Wh-throughput for all the test conditions; (2) after the initial period, certain cycling conditions exacerbated aging rates, while the others remain the same. The statistical results show that: (1) except for t1, the other six principal factors significantly affect the aging rate; (2) the strength of the principal factors was ranked as: i1 > V1 > T > t2 > V2 > i2 > t1. One more study performed in the Netherlands as part of a 2017 PhD thesis on LFP batteries by Li D. found results (pp. 139-140) somewhat similar to Batteries2020 (hopefully it's not the same data). Again discharging at 20C ambient temp, the DoD had little overall effect (under 5%), but this gets more pronounced at higher temps... but there's also an interesting inversion when one considers energy throughput loss rather than just cycle loss because cycling with a smaller state-of-charge window extracts less energy per cycle from the battery. In terms of energy throughput loss, discharging from DoD 0% to 100% was less detrimental than discharging from 70% to 100% above 40C ambient. At 60C ambient all partial discharges fared worse than a full discharge in terms of energy throughput loss. From Figs. 6.20b and c it follows that the decrease rate of [max charge / max initial charge] for SoC = 0-100% is smaller than cycling in the range of SoC = 70-100% at 40 [deg] C (Fig. 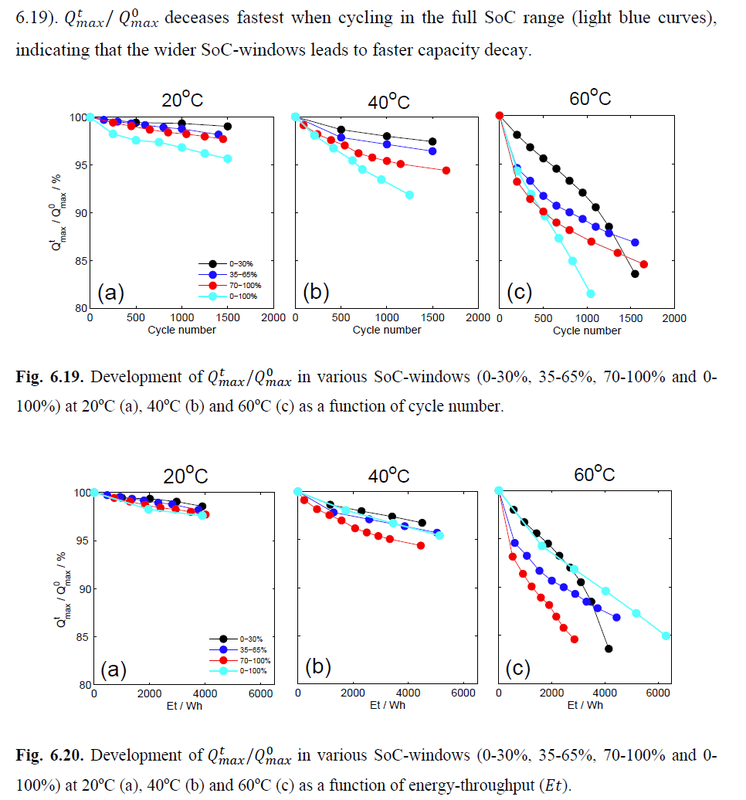 6.20b) and is small compared to other partial cycling SoC-windows at 60 [deg] C (Fig. 6.20c). So, to draw a conclusion from all this, it looks like the effect of fully discharging a Li-ion battery (of various chemistries) is fairly negligible for consumer electronics. BU is technically correct that Li-ion batteries (like most rechargeables) will lose less capacity per cycle when not fully discharged, but this loss is pretty small for Li-ion batteries at the usual room temperature for consumer electronics, which is the gist of the paper cited by AccuBattery; the latter site exaggerates their finding by claiming the effect is zero, which appears not to be the case based on data from studies that allow better estimation of the small effect. Furthermore, a cycle with a smaller state-of-charge window also yields less energy, which further reduces the effect of full charge-discharge cycles if one considers energy throughput rather than cycle numbers. Not the answer you're looking for? Browse other questions tagged mobile-phones electronics battery . Does mandatory registration of SIM cards reduce terrorism?